The Pathmaker is still broken and awaiting a new dana 300 so I decided to get down to some lingering projects. In the last post I had videos of fabbing up some new bump stops, as well as fabbing up a rollbar for my GoPro Hero5 on my windshield bar for those sweet dash cam videos. 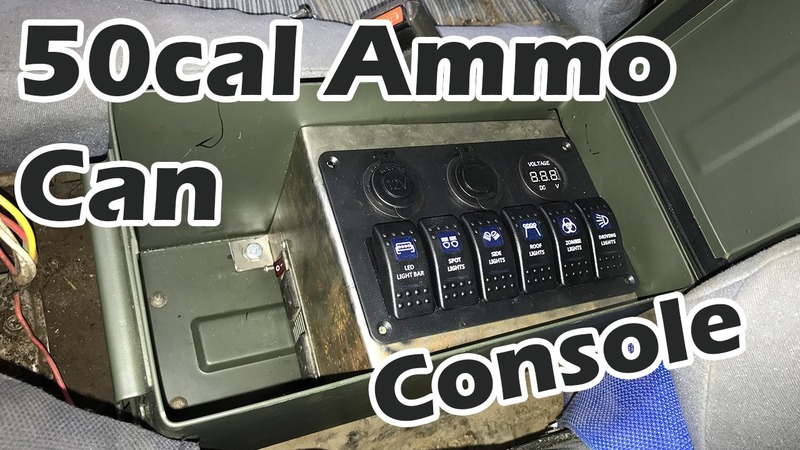 Next project on the list was pulling the old stock Nissan Pathfinder center console and replacing it with a 50cal ammo can as well as putting a 6 switch panel and 375W inverter inside the can. Tired of all my switches being constantly flipped by either my arms, my dogs feet or whatever else is bumping around in the cab, as well as the need for a secure space to charge batteries I decided to look on Amazon for a few items including a brand new 50cal Ammo Can, a 6 switch light panel with usb chargers and a 375W Inverter. The plan is to use the panel to run my On-Board Air, my Baja Designs LED cubes, rock lights, interior lights and winch on/off while leaving one switch open for future upgrades.